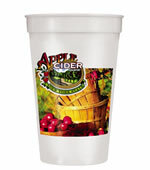 Custom Imprinted, Reusable Stadium Cups make great promotional items for corporate events, parties, weddings, school events, sporting events, bat-mitzvahs, bar-mitzvahs, get-togethers, and more. Our Full Color Custom Stadium Cups are also perfect for carnivals, festivals, picnics, or anywhere that people might be drinking cool beverages. Plastic Lids and Straws are also available for use with our Stadium Cups.